28 pages with plates, table and diagrams. Octavo (8 1/4" x 5 1/4") issued in wrappers. (Bibliotheca Van der Linde-Niemeijeriana: 5072). First edition. Edgard Colle was a Belgian chess master. He scored excellent results in major international tournaments, including first at Amsterdam 1926, ahead of Savielly Tartakower and future world champion Max Euwe; first at Meran 1926, ahead of Esteban Canal; and first at Scarborough 1930, ahead of Maróczy and Rubinstein. His playing career was hampered by ill health. He survived three difficult operations for a gastric ulcer and died after a fourth at the age of 34. George Koltanowski was a Belgian-born American chess player got his first big break in chess at age 21, when he visited an international tournament in Meran, planning to play in one of the reserve sections. The organizers were apparently confused or mixed up about his identity and asked him to play in the grandmaster section, to replace an invited player who had not shown up. 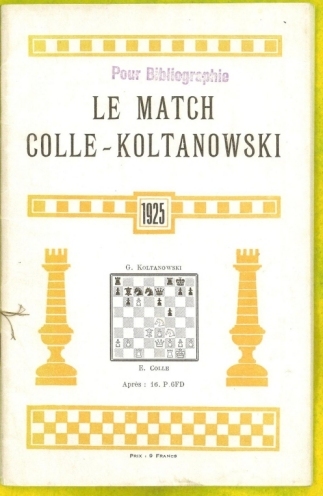 Koltanowski gladly accepted and finished near the bottom, but drew Grandmaster Tarrasch and gained valuable experience. He thereafter played in at least 25 international tournaments. His best results were wins in Antwerp 1932, and Barcelona 1934 and 1935. He was Belgian Chess Champion in 1923, 1927, 1930, and 1936. However, Koltanowski became better known for touring and giving simultaneous exhibitions and blindfold displays. 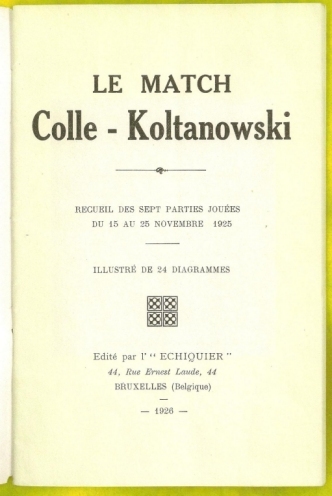 Koltanowski and Colle were the two strongest Belgian players of their time as well as very good friends. Stamp to front wrappers, some edge wear lightly soiled else a very good copy.